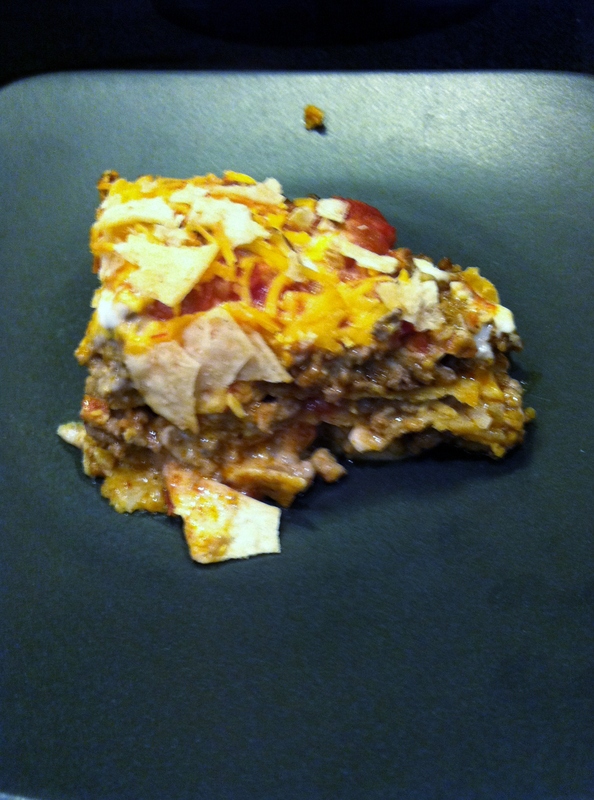 This is a recipe I threw together one night when I wanted something quick to make for dinner and was limited on what was in the freezer and pantry. Tacos are always quick and easy but I just wasn’t in the mood for plain old tacos again. 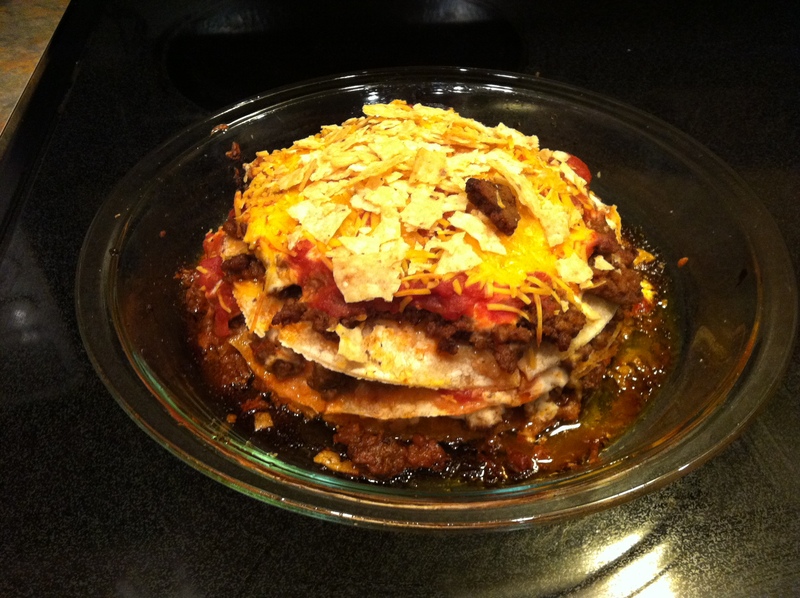 I ran across a few taco bake recipes online, but those didn’t appeal to me either. That’s when I came up with this recipe. Since I only have to cook for two, I decided to use small corn tortillas, but I would suggest using larger tortillas as well as doubling everything else in the recipe if you are making it for more than two people. The version I made technically makes 4 servings (cut the pie in 4) but my husband had two pieces and I had almost a half of the fourth piece. Also, it will probably make a nicer presentation in the pie dish with the larger tortillas, as they should fill up the entire dish. Brown the ground beef and drain off any excess grease. Add the taco seasoning to the beef, per the package directions. In a pie dish, place one corn tortilla in the bottom. Spread about 2 tbsp. sour cream (more or less to taste) over the tortilla, about 1/2 cup of the ground beef, 1/4 cup of the salsa, and 1/4 cup of the cheese (more or less to taste). Repeat with the remaining ingredients to make layers. Sprinkle the top layer with the crushed tortilla chips. That was really a great meal!Very satisfying and not to mention very tasty!